Before you plan to make these delightful Beet “Sandwiches” for lunch, I will warn you that these aren’t your typical sandwich. Rather these sandwiches are a fantastic appetizer or afternoon snack and remind me of a cross between beet and goat cheese salad, spinach artichoke dip, and classic cheese and crackers. 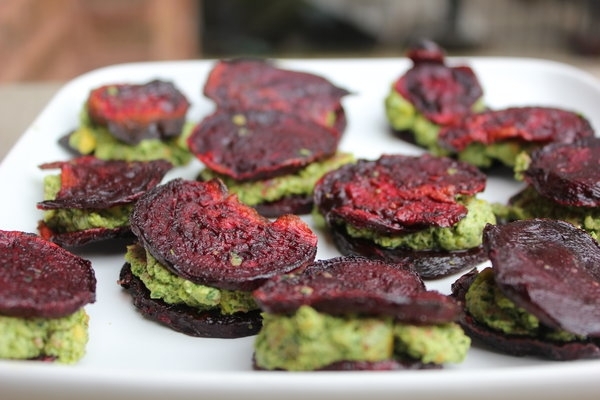 When I made these I sliced the beet chips fairly thin so they produced a crunchy chip–the crunchy, subltly sweet beet chip served as a perfect compliment to the creamy pistachio filling. I think the filling would go great with other veggies such as sweet potatoes and zucchini; this would make for a really fun and colorful appetizer too. To tell you the truth, I was a little skeptical when I first heard the recipe had the word “beet” in the title. I associate beets with the sweet and chewy side dish that I avoid adding to my plate full of stuffing and turkey on Thanksgiving. But I’m glad that Meg chose this recipe because it forced me to befriend a vegetable that I would never spent much time with otherwise. As it turns out I really enjoyed this recipe, and I think beets and I are going to become good friends. I still have one beet left in my fridge and would love to hear about your favorite beet recipe. You can see other other bloggers’ “sandwich” renditions at The Food Matters Project. Heat oven to 400°F. Slice beets so they are about 1/8 inch thick (slice thinner for crispier chips). Toss beets in 1 tablespoon of olive oil and a few pinches of salt. Spread beets out on a baking pan. Bake, flipping once, until crispy, about 30 minutes. Remove from oven and cool on wire rack. Combine the goat cheese, pistachios and arugula in a food processor. Add salt, pepper and remaining olive oil. Continue running food processor and add more oil until the mixture is creamy. Spoon about 1 tablespoon of filling onto a beet chip, top with another chip and press gently together. Repeat with all the chips and serve immediately. i’ve only been eating beets for about a year and i think i was just turned off by how it was presented to me before. when it’s in something as simple and delicious as this week’s recipe, it’s a great veg to be friends with. i like it best when it’s simply roasted and added with fresh greens like purslane, sorrel or arugula. i have pickled it before and it’s enjoyable that way too. i love how beautiful this recipe turned out to be… your picture is lovely! Thanks for the idea Lan–I have some extra arugula in my fridge I need to use! Hooray for beets! Your sandwiches look fab! I didn’t think I liked beets much either up until fairly recently, and I’m not sure why. But now that I know about them, I can’t get enough! I’ve been thinking since making this recipe that these beet chips would be great on salads for some added crunch. Yours look like they came out perfectly! Did you go with the 1/8 inch suggestion or a bit thinner? Meg, added to salad sounds delicious! And I did end up cutting them slightly thinner than 1/8th inch. I also baked them about twice as long as the original recipe called for–about 30 minutes instead of 15.